WAKEFIELD, Mass. 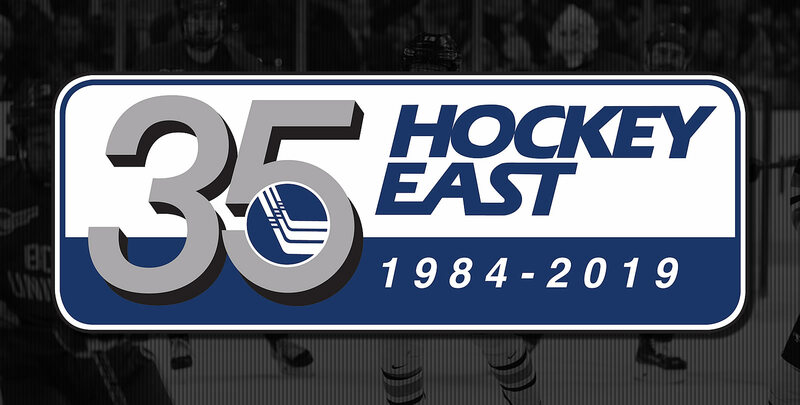 - Fan voting for the Hockey East 35th Anniversary Team is now open, the league announced today. The selection of the all star team is part of the conference's year-long celebration of 35 years of excellence. Fans can vote for a team of 35 forwards and 35 defenders, including defensemen and goaltenders, as part of the 35th anniversary celebration until February 15. The special team will be chosen by a combination of fan voting and league committee voting, consisting of league staff, school staff and members of the media. Members of the Hockey East 25th Anniversary Team, denoted by asterisks on the ballot, were automatically placed on the 35th team ballot. The remaining nominees were selected by the conference and school staffs for each player's accomplishments while playing in Hockey East. To submit votes, fans can visit HockeyEastOnline.com and select 20-35 forwards and 20-35 defenders for a maximum of 70 players. Submissions that do not fall within these vote ranges will be discarded. Fans may vote once each day per valid email address through Friday, February 15. The final Hockey East 35th Anniversary Team will be announced prior to the annual Hockey East Championship at TD Garden, March 22-23. Tickets for the 2019 Hockey East Championship Tournament at the TD Garden are now available to purchase at the TD Garden Box Office. Tickets can also be purchased online at www.ticketmaster.com (Purchase semifinal tickets - Purchase championship tickets) or by calling Ticketmaster at (800) 745-3000. Hockey East Tournament semifinal games will take place Friday, March 22. Puck drop is scheduled for 4:00 p.m. and 7:30 p.m. Ticket prices start at just $17 in the balcony, $39 in the loge, and $43 for club seats and the first row of the loge. Semifinal tickets include admission to both semifinal games. Winners of the semifinals will advance to the Hockey East title game, set for 7:00 p.m. Saturday, March 23, to determine the winner of the Lamoriello Trophy. Student tickets, located in the upper balcony, will be made available for $10 when showing a valid student ID, either on campus or at the TD Garden Box Office. Groups of 15 or more are also eligible for a $5 discount on $17 balcony seats and a $7 discount on select loge seats. All discounted tickets must be purchased at the TD Garden Box Office. To take advantage of group discounted tickets, contact the TD Garden group sales department at 617-624- 1805 or groupsales@tdgarden.com Tickets will become available on the campuses beginning on Monday, March 12 when the four remaining schools are identified. The winner of the conference tournament receives an automatic berth in the NCAA Division I Ice Hockey Champion - ship Tournament. The Hockey East Association is an 11-team Division I college men's hockey conference founded in 1984 and a 10-team Division I women's league which began play in 2002-03. The men's league has won nine NCAA champion - ships in the past 25 years including Providence College in 2015 at TD Garden in Boston. Since 1999, Hockey East has won seven NCAA Championships with 15 NCAA Championship Game appearances, while placing 25 teams in the Frozen Four and 68 teams in the NCAA Tournament during that time. Overall, Hockey East has sent 112 teams to the NCAA Tournament since its inaugural season, more than any other conference in that span.